Social Donors represent nonprofits with a unique new group of donors to tap into. Approximately 40 percent of Social Donors are first-time donors for an organization , and many are not deeply familiar with the nonprofit prior to giving. Remember Social Donors are those that prefer to donate through events, peer-to-peer campaigns or virtual occasion/challenges. They are often invited to participate by their friends, colleagues or others in their social networks. Personal connections are what draw them into your fundraising efforts. The question is…what are you doing to engage them? Because Social Donors are not necessarily deeply connected with your cause, the donor experience is vital to getting them to 1) complete a donation, and 2) stay engaged for repeat gifts. It’s true that Social Donors must be wooed like any other donor, but they have a specific set of motivators that nonprofits needs to trigger. Besides the mission of the nonprofit and the impact their donation will have, the top motivator for Social Donors is an easy giving experience. In fact, according to a recent study from OneCause, the giving experience – aka, how easy it was to actually make a donation – was the top reason Social Donors made a donation. Think about it, they are not deeply connected to the cause. In some ways, they are like any online shopper, you have to grab their attention and make the donation experience seamless. You have one shot to get it right! For nonprofits this means looking at your donation vehicles and channels through the eyes of a Social Donor. Ask yourself the following questions to evaluate the ease of your donation processes. Are you relying on manual ways to give? Can donors give anytime or anywhere? Do you use technology? Is it mobile-optimized? Do you have multiple CTAs and donation buttons for quick giving? How many steps or clicks are needed to give? Can donors customize their giving levels? The giving experience is also incredibly important when it comes to retaining these donors and converting them into lifetime supporters. Forty-two percent of Social Donors say they will donate again to an organization because the giving experience was positive and easy. Revamping your giving experience helps increase donations, establish long-term donor relationships, and show these new supporters that you’re conscious and aware of the effort they’re making to be a part of your cause. Online giving should not be hard. With the right online giving platform, nonprofits can create intuitive, flexible online sites, including individual microsites, for donors to engage with. Things like easy-to-follow forms, real-time leaderboards, and fully secure payment processing make the donation experience enjoyable and worry-free for first-time donors. Mobile technology is no longer the new frontier – it’s absolutely here to stay. Social Donors, like other donor groups, expect to be able to experience the full suite of donation solutions no matter where they’re coming from. Social Donors should be able to access an entire online giving site as well as Text2Give technology for maximum donation simplicity. Social Donor campaigns are all about your current supporters leveraging their social networks to attract new donors. In order for them to maximize their efforts, they need powerful tools and solutions that help strengthen engagements and cast a wider net to their networks. It’s up to nonprofits themselves to empower their current supporters to help draw in and engage new Social Donors. 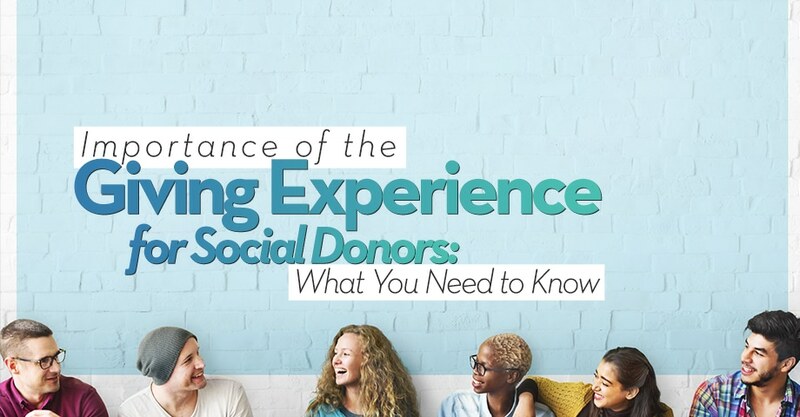 Because the giving experience is so important to attracting and retaining Social Donors, optimizing this experience is especially critical. Nonprofits should take proactive steps to ensure an amazing donation experience. Take an online tour of OneCause today.